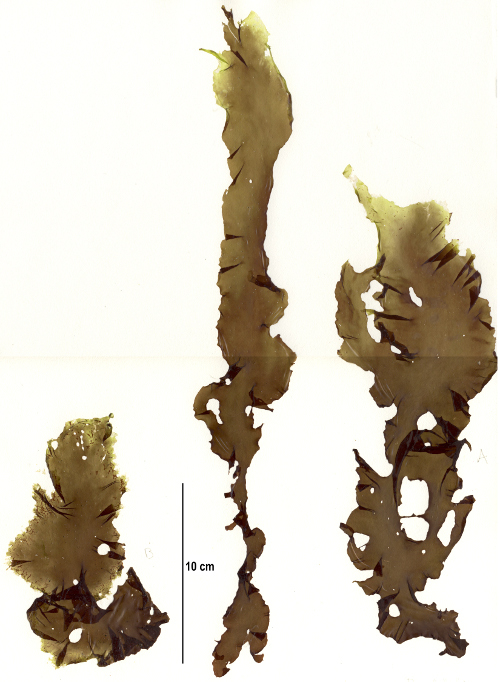 Pyropia columbiensis is a new seaweed species described from collections on Calvert Island. Search the UBC Herbarium Algae Databasefor more information on these specimens, or search the species for further occurrences. Images courtesy of Sandra Lindstrom. ​Pyropia columbiensis is a red seaweed recently described from collections on Calvert Island. It is one of a few species new to science that resulted from genetic work on the Pyropia lanceolata species complex — a group of Pyropia species that look very similar. The thallus of Py. columbiensis is narrowly oval in shape and tapering to a point (lanceolate) when young, with a wider shape when mature (ovate). Its olive-green colour changes greyish or brownish-purple when it dries out. This species grows on rock—usually rocks partially buried in sand—in the mid to high intertidal throughout winter and early spring. Its recorded distribution extends from Calvert Island, British Columbia, to Cape Mendochino, California. At the same time as Py. columbiensis was described, a morphologically identical species--Py. montereyensis, found in California south of Cape Mendochino—was also described. The two species are northern and southern sister species occupying the same niche but with distributions separated by Cape Mendochino. More information about this newly described species and its relatives is available in Sandra Lindstrom's Hakai blog post and scientific publication. Lindstrom, S. L. (2015). A New Species of Nori-Like Seaweed From Calvert Island. Science on the Coastal Margin. Hakai Institute. Lindstrom, S. L., Hughey, J. R., and Rosas, L. E. A. (2015). Four new species of Pyropia (Bangiales, Rhodophyta) from the west coast of North America: the Pyropia lanceolata species complex udated. PhytoKeys. 52:1-22.